This article is about the Brooklyn Plumbers Academy. For The Super Mario Bros. Super Show! similarly named episode, see Plummers Academy. —Brooklyn Plumbers Academy Motto, "Plummers Academy"
The Brooklyn Plumbers Academy, also known as the Plumbing Academy, is an academy that teaches people how to be plumbers and was founded by Salvador Drainado, the best plumber in the world. The teaching methods at the academy are mostly drills and are taught by Sergeant Kooperman. 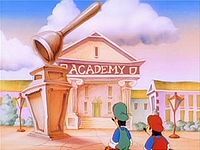 Mario and Luigi were taught at the academy. The Brooklyn Plumbers Academy first appears in The Super Mario Bros. Super Show! episode "Plummers Academy". It was later mentioned in the Nintendo Adventure Book Dinosaur Dilemma. Brooklyn Plumbers Academy is shown as a building that contains a banner which is simply written as "academy". As found in the picture in the right is a plunger statue. This page was last edited on September 26, 2018, at 12:39.